NEW YORK--(BUSINESS WIRE)--Popular Community Bank, a subsidiary of Popular, Inc. (Nasdaq: BPOP) and one of the nation’s premier community banks, together with partner Operation HOPE celebrated the launch of HOPE Inside in the Bronx yesterday. Deputy Borough President Aurelia Greene joined local community leaders, entrepreneurs, and customers gathered at the Popular Community Bank branch at 752 East Tremont Avenue to inaugurate the HOPE Inside location that will concentrate on home ownership and financial literacy programs. 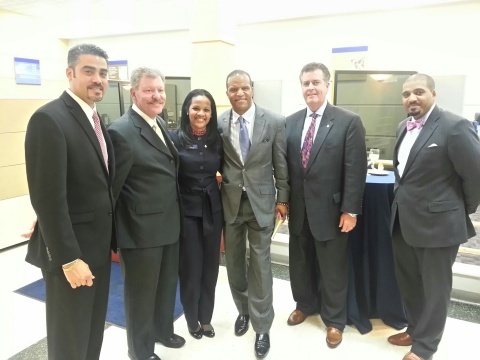 This is the second HOPE Inside location opened in a Popular Community Bank branch in New York. The first, inaugurated April 1, 2014, is at 231 West 125th Street in Harlem. The partnership to develop the HOPE Inside program commenced in November 2013 with a commitment from Popular Community Bank for four locations in the New York area. Popular Community Bank has committed to launch two more HOPE Inside locations this year, starting with a location in Brooklyn’s, Crown Heights area. The HOPE Inside location at the Popular Community Bank East Tremont Avenue branch offers financial literacy programs and “The Homeownership Program.” The Program includes homebuyer education, workshops, guest speakers, and one-on-one counseling to guide would-be homeowners through the process of realizing their dream of homeownership. Classes start Tuesday, June 24th in the East Tremont branch lobby and guest speakers will cover loan approval, credit & debt, purchase contracts, escrow/closing costs, necessary paperwork, required savings and more. Interested participants can obtain more information about the Homeownership Program at the Tremont branch or call (973) 343-9952. Note: Photographs of the event are available upon request. The mission of Operation HOPE, Inc. (HOPE) is silver rights empowerment, making free enterprise work for everyone. It promotes financial dignity through the delivery of financial inclusion and education tools to underserved communities. Through its core divisions, the organization has provided youth and adult financial literacy, economic preparedness, digital empowerment, promoted home ownership, and assisted with foreclosure prevention to more than 2 million individuals, families, and small business owners. HOPE's next phase will be focused on Project 5117, a multi-year initiative that will track and increase business role models for youth, boost credit scores for adults, and empower underserved communities. To learn how you can join Project 5117, go to www.operationhope.org. Founded in 1893, Popular, Inc. (NASDAQ: BPOP) is the largest banking institution by both assets and deposits in Puerto Rico and ranks 39th in the United States among the largest banks and thrifts by total assets as of March 31, 2014. In the United States, Popular has established a community-banking franchise that does business as Popular Community Bank, providing a broad range of financial services and products, with branches in New York, New Jersey, Illinois, Florida and California. On April 23, 2014, Popular entered into definitive agreements to sell regional operations in Illinois, Central Florida and California, including 41 branches. Upon regulatory approval of the sales, Popular Community Bank will have 49 branches in the New York/New Jersey and South Florida regions. HOPE Inside location at Popular Community Bank's East Tremont Branch in the Bronx opens - giving the community access to financial literacy and education on home ownership.